The Venture Bros Exclusive Sheet Set Review! 1 Comment on The Venture Bros Exclusive Sheet Set Review! The all-new sheet set from Adult Swim is available just in time for the holidays! The Venture Bros Sheet Set is a limited edition collector’s item for fans of Jackson Publick and Doc Hammer’s animated adventure. The set includes two pillowcases, one top sheet, and one fitted sheet, and is a must-have item for Venture Bros. fans! The sheets themselves are covered in designs featuring characters from the show, such as Dean and Hank Venture, Dr. Venture, The Monarch, Brock Samson, and more! 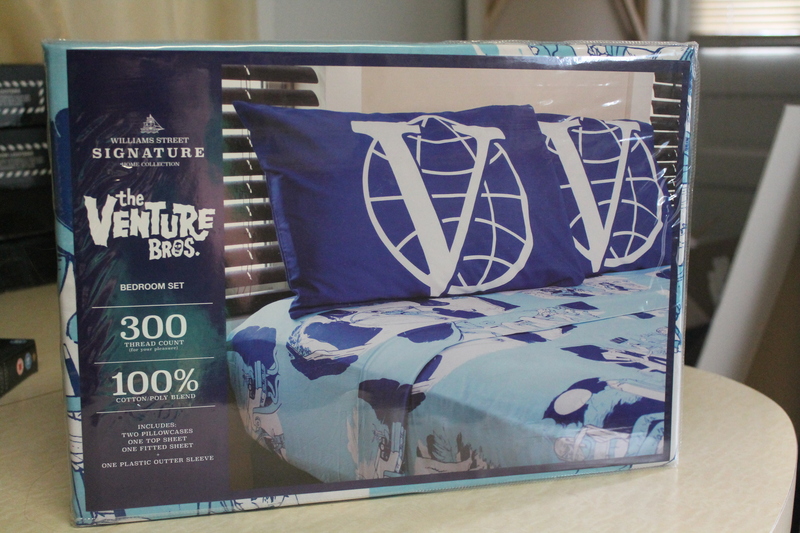 The Venture Bros Sheet Set is an extremely quality limited edition collector’s item for the low price of $50. This sheet set features characters from the Venture Bros. show, and is also very comfortable. What more could anyone ever want? To buy a Venture Bros Exclusive Sheet Set, click on the link here! You can view more images from the sheet set below. For all things Adult Swim, keep it here on NYCityGuys! Previous Entry Celebrate Saddlenalia With Einhorn’s Epic Cookies!